Sara and Amber are in middle school and are best friends. They also share a love of horses, but problems in their small town of Copper Canyon test their sense of right and wrong and could hurt their friendship. When Sara sees a bobcat on a trail, the people of Copper Canyon dont feel safe on the trails. They want that bobcat to leave! But Sara and Amber care about the bobcat, too. Is there a way for people and wild animals to live in peace? People in Copper Canyon hear that the old copper mine may open again. That will bring jobs to town. Amber thinks the mine is making people sick. She wants to keep it closed. People are angry with her. Even Sara wont speak to her! When Amber fails to make the basketball team, she is angry and hurt. She turns her back on Copper Canyon. She even stops riding the horse she loves. Then she starts to hang out with a girl who may not be much of a friend. A new man starts work at the Gomez ranch. One day a horse gets sick and dies. Soon Ambers horse is sick, too. Did someone hurt the horses? Sara lies to her parents to go to a high school party with Amber. At first she is shy, but then a lot of boys start looking at Sara. Amber thinks she and Sara should go home. Why wont Sara go with her? FREE Teacher's Guide and Comprehension Questions available by clicking on the Teacher's Guide text in Check it Out! box at right. Our comprehension questions in Teacher's Guide are aligned with the Common Core State Standards. You may make copies of the Teacher's Guide for use in your classroom. 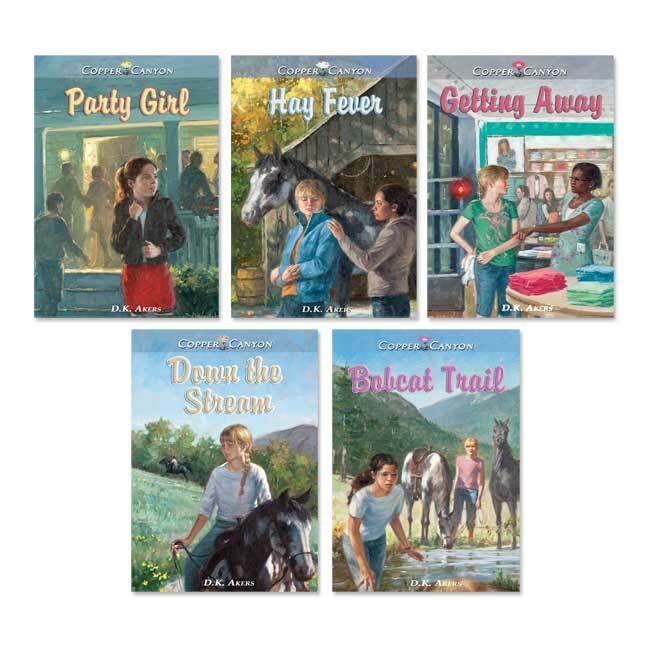 These great stories are available on a preloaded, portable go reader audio player that allows students to listen to an entire set of books (all 5 titles in set). Comes ready to play, with batteries and earphones. Easy to use, just hit the play button, and go. Length of each audio book title is approximately 30 minutes.